We are among the top most manufacturers of Ointment Vessel. 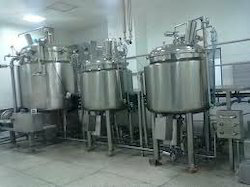 These vessels find their application in food, beverage and pharmaceutical industries. Owing to their availability in various sizes and high durability, our offered vessels have gained huge popularity among the industrial patrons. We deliver them after several stages of quality checks. Established in 2007, Water System Equipments has gained an admirable position in manufacturing, supplying and exporting of SS Water Treatment Plant, RO Water Plants, Stainless Steel Products, SS Storage Tanks, SS Spray Balls, SS Zero Dead Leg Valves etc. Precisely engineered and accurately designed, offered equipments find their application in pharmaceutical, food, dairy, beverage and hydraulic industries. Our professionals use corrosion resistant steel and latest technologies in the manufacturing line. Moreover, we follow global standards in the engineering of our products. Our product range includes Demineralization System, Water Storage and Distribution System, Softening System, SS Water Plant, Distribution Skids, RO Edi Plant, SS RO Plants, SS RO Plant etc.